This page contains a character guide for Green Lantern in Injustice 2. Here you’ll find movelists, combos, juggles and strategy guides and recommended gear for the Hero character. For more Injustice 2 content, head over to our Injustice 2 top page. Click here to go to our Injustice 2 Heroes Directory! A former test pilot, Hal Jordan was chosen to join the Green Lantern Corps because of his fearless heroic nature. His power ring, which he uses to create anything he can think of, is powered by his will. He is classified as a Power User. Hal Jordan possesses a powerful force of will that allows him to wield the most powerful weapon in the universe: A green power ring, forged by the Guardians of the Universe and charged with the green light of the emotional spectrum, willpower. The ring can create any construct, and is only limited by Hal’s imagination. The ring afford’s Hal with a protective barrier of light around his entire body, shielding him from bodily harm that would kill a normal person, such as a punch from Superman, and allows him to survive and speak in the vacuum of space, as well as affording him with the power of flight at the speed of light and high degrees of superhuman strength. Below are combo and juggle inputs for Green Lantern , including corner strategies and restarts. 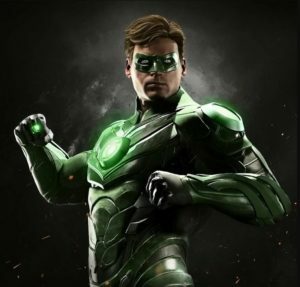 The Green Lantern of Injustice 2 is quite different from his Injustice: Gods Among Us in terms of gameplay and strategy. Some of his known special moves have changed (his Mini Railgun and Rockets do not appear on his move list anymore but can be attained in gear abilities) and to most players the Green Lantern of Injustice 2 is more or less like a new character altogether. He can be a bit tricky to use. He can easily close the distance with opponents with his melee combo attacks while utilizing his special moves to bring an extra dosage of pain on his enemies with his juggle combos. In addition, if the opponent is fleeing and going on the defensive end there will always be the choice of putting pressure on the opponent with his new and various special moves (example would be Overcharged Lantern, Bowled Over and Lantern blast). With this tactic, not only are you applying pressure but also keeping your opponents at bay while setting up for combos. Furthermore, he can make due with increasing his special moves’ damage by utilizing his character power. Overall, Green Lantern is force to be reckoned with and would be classified more as a Mid-range character that has various option to deliver pressure while keeping his opponents out of range for him to setup his gameplay. As an opponent, it would be wise to always be on guard as most of his attacks types are Mid and its also best to improve your defense against range attacks, close range melee combos (like utilizing throw escapes, quick escapes, counters and reversals) and always look out for the perfect timing to deliver punish attacks to reset the situation or be the one to take advantage. The secret to mastering Green Lantern is by mastering timing and practicing his various combo attacks and special moves to be familiar of what to use in any situation. Green Lantern wears a green domino mask to hide his identity and a green and black uniform, like all Green Lanterns. His shoulder and torso are green while his legs and arms are black. He wears white gloves and green boots. His costume is laced with green energy that glows. He also has the Green Lantern symbol on his chest. 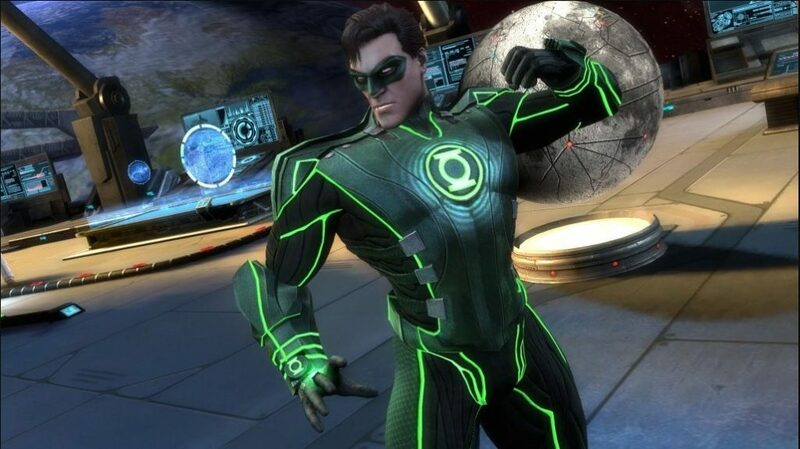 Green Lantern wears a modified costume with more padding on his shoulders. He also has green metallic gauntlets with the Green Lantern symbol on his wrists. He retains his green domino mask and torso, however the logo on his chest glows and the sides of his torso and underarms are black. He also has green straps on the sides of his torso. His inner thighs are also black while his outer thighs are green. His outfit is still laced with glowing green light. Despite the title, Hal is never seen wearing this as a member of the Regime. Outfitted in a Yellow version of his Regime Costume. It functions as both Hal’s uniform for the Sinestro Corps and as his official Regime costume. (Unlocked by winning one Ranked Match).